2012-09-26 Erik Hansen-Hansen in Research Cafe at the Design Museum. In conversation with Mads Nørgaard, Maria Mackinney-Valentin, and the audience on the subject of fashion. 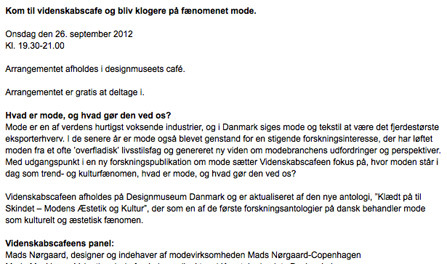 Link to event discription at the Design Museum Denmark’s website. Link to event discription at the Research Cafe website.